Fly-fishing legend Bernard “Lefty” Kreh has either authored or contributed to more than twenty books over the course of his illustrious fifty-plus-year career. Along the way he revolutionized fly casting, designed various fly rods, and developed legendary fly patterns such as The Deceiver. Lefty received the Lifetime Achievement Award by the American Sportfishing Association and the Lifetime Contribution Award by the American Fly Tackle Trade Association, and he has been inducted into the Freshwater Fishing Hall of Fame as well as the International Game Fish Association Hall of Fame. In this book excerpt, co-author Dave Karczynski speaks with Lefty about what he’s learned from a long life spent chasing the bronze bass. DK: Legend has it that your first fish on a fly rod was a smallmouth bass, is that correct? LK: That’s right. It was on the Potomac River. I think it was 1947. It was really the beginning of my fly-fishing career, if you want to call it a career. That first fish came not long after my first casting lesson ever, which just happened to be with Joe Brooks. DK: How did that come about? LK: Well, one afternoon I invited Joe fishing. He was just a writer for a small newspaper at the time—he wasn’t yet the big deal he’d become later on. I was fishing a baitcasting rod and he was fishing a fly rod on that first outing. And he really impressed me with that fly rod. Nobody I knew in Maryland used a fly rod at that time for bass. They did a bit of trout fishing with a fly rod, but there really was no bass fishing at all with fly rod. In any case, I was so impressed with how well Joe did on the Potomac with me that the next day I drove fifty miles in a Model-A Ford to where he lived in Baltimore to take a fly-casting lesson from him—and I paid good money for that lesson. DK: What was that first lesson like? LK: What he taught me was that nine o’clock to one o’clock stuff that most people teach, which was a good place to start because I had no idea what I was doing with a fly rod. But I knew other tackle. By that time of course I had already caught hundreds of bass on baitcasting tackle. I say baitcasting because this was prior to the spinning reel coming over to the United States from Europe. Of course, there may have been a spinning rod here and there, but for the most part no one knew about them. So prior to taking up the fly rod, I simply threw tiny plugs on a casting reel. And it’s because of the reel, or rather, the limitations of the reel that I really got interested in fly casting. That’s because over the years of smallmouth fishing I had noticed that smaller lures would catch more fish. The problem was that those small lures were hard to cast with the reels we were using. Basically, I needed a different technology to catch more bass. After I was taught by Joe, I became competent with the nine to one style. But it wasn’t long before I realized that I just wasn’t covering enough water with my casts. I could catch a lot more fish, I knew, if I could add distance and keep my fly on the water longer. This was when I first started to experiment with casting strokes that would really gain the fly angler distance. At the time, nobody took their rod back past two o’clock. It was a religion not to do that. In fact, in 1965 I wrote an article on situational casting in Outdoor Life with a drawing that showed how to take the rod back behind you—past two o’clock. Well, they got a lot of nasty letters on the thing. A lot of nasty letters. DK: What did those first few forays with a fly rod teach you about smallmouth that you hadn’t known before? LK: The first thing I learned was that they sure do take popping bugs! And the second thing it taught me was if I can learn to make longer casts, which I could not do with that limited casting stroke, if I could make longer casts I could catch more fish. 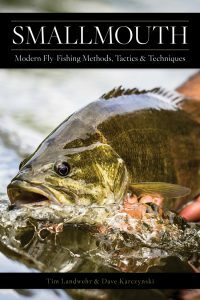 And so the smallmouth bass encouraged me, I guess you’d say, to learn a different way of fly casting, which of course over the years would become the way most people cast. So a lot of modern single-handed fly casting can be attributed to the smallmouth and smallmouth bass fishing. DK: What were the rivers like back then? LK: They were fantastic. All of our rivers here, the Potomac, the Susquehanna, the Shenandoah, and the James, all these rivers back in the 1940s and 1950s and 1960s were teeming with smallmouth bass. There were just unbelievable amounts of food. Almost all the rocks held hellgramites and crawfish, and you could catch as many madtoms for bait as you pleased. All you had to do was take a net down to the grass bed and you could catch ten or fifteen of these madtoms in fifteen, twenty minutes. Those madtoms were a great bait for bass because you hook them up and they’re tougher than a bad mother-in-law. You could use them all day long and at the end of the day they’d still be swimming. So it’s true that we had unbelievable smallmouth fishing back then, but plenty has changed in the interim. In fact, you guys living in the north, in Maine and Wisconsin and New England and that area up there, have no idea how pristine your rivers are compared to the rivers we have here now in the Mid-Atlantic region. Our insect populations have suffered notably as a result. Decades ago the ephorons were so thick that you could barely breathe. I have a photograph from a night I was fishing with Bob Clouser. I had a rigged rod lying on the back deck and it was dark. We were in Bob’s boat and he had one of those lights that stick up about three feet when you’re running at night. We were just drifting along fishing–this was in the Susquehanna, mind you, below Harrisburg, which is a big city. In any case, there were so many insects around that when I went to look for my fishing outfit that was lying on the back deck, I couldn’t find it because it was buried in ephorons. When I picked up the rod I said, “Bob, take a photograph of this.” And I put my hand down and held up a pile of ephorons almost the size of a coconut shell. Today, however, you’re lucky to see five hundred bugs in an evening. That’s the kind of stuff we’ve lost in a sense. DK: What’s the perfect smallmouth river? LK: What makes a good smallmouth river is a number of things. First, you got to have little and big bass and stuff to feed both of them. The second thing is, you need cover. In addition to all the nutrients in the water, you need cover. If you’re fishing largemouth, wood is often the most important type of habitat. For smallmouth, rocks are terribly important. And not only just rocks: You want different kinds of rocks because different rocks form different kinds of ambush spots for fish of different sizes. DK: So we should be relieved to catch small fish from time to time? LK: You bet. You need all your classes to continue to produce good fishing. The best rivers, if you’re talking about habitat, the best ones, I think, were in the Mid-Atlantic area. To start with they had a limestone base. That limestone leaches minerals, which enriches the water, which enriches the microhabitat, the small insects and things like that. You also need grass along the shoreline for the minnows to hide in, aquatic grasses for the baby bass to hide in and for the food to hide in. And then you need little riffles and gravel places to aerate the water. You need those highly oxygenated places for your insects to live, and you need slightly bigger rocks for the crawfish. In addition to ripples you need pools where in the wintertime smallmouth have a sanctuary. But a river shouldn’t be all long, deep, slow pools. Bass can live there, but there are not nearly as many of them as if there were intermittent pools and ledges and rocks and ripples and so on. You need all these combinations of cover and structure and habitat to feed and provide protection for bass from the time they are fry to the time they are five-pounders. Lastly, I don’t think the perfect smallmouth river should be crystal clear. I firmly believe that when water is too clear it’s not good bass fishing. The reason for that is that if you have really clear water the prey can’t escape, and so you end up with less food for everyone and therefore smaller bass. If eating is too easy, all the food disappears real quick. DK: So, smallmouth rivers are all different. What about the fish themselves? LK: I’ve never talked to a scientist, but I firmly believe from my own experience, which is more than sixty years of catching bass, that there have got to be several subspecies of smallmouths. We now know that there are fourteen subspecies of bonefish. There are certain places you’ll go to and almost never catch a bonefish over three pounds. Other places the bonefish will average three to five pounds. And then there’s places where you frequently catch bonefish over ten pounds. And I wonder if the same is also not true for smallmouth bass. I’ve been on rivers where you’re not going to catch many big bass ever, even if the habitat seems ideal. I’d be curious to hear what the biologists would have to say on the subject. DK: What advice would you give to the trophy smallmouth bass hunter? LK: I’ve been fly fishing and tying flies since the 1950s and my observations about what takes trophy fish comes down to two things: materials and size. Natural materials, be they fur, feathers, or hair, are far more effective on streamers and popping bugs than synthetics. If you’re going to use synthetics, you definitely need to incorporate some natural material into them. Straight synthetic flies are not nearly as effective in taking truly large fish, I have found. DK: I know you’re a fan of fishing topwaters for smallmouth. Describe for us your perfect popping bug. LK: Well, to do that we need to define the criteria for a good popping bug. First off, a good popping bug is one that’s easy to cast but still puts out a good profile in the water. Second, a good popping bug pops every time. Third, it should be easy to lift from the water so you don’t scare the fish with that blooping sound when you pick it up. Next, it should hook the fish easily. And finally, it should have rubber legs. I spent twenty years working on a popping bug that works every time and you can use it for little tiny brim or you can use it for barracudas. That bug, first of all, uses squirrel tail hair to form the tail of the popper. I’m convinced squirrel hair is superior as a tailing material on popping bugs. If you don’t believe me try this: Tie a fly with any kind of hair except squirrel and tie another one with squirrel tail hair. Then drop them in the water. You’ll find that the non-squirrel-hair fibers mat together in the water. Only the squirrel tail hair fibers will flair in every direction. But that’s not all. Not only does squirrel give you a larger profile on the water, but when you pick your bug up out of the water to recast, those fibers become as sleek and aerodynamic as can be. Stay away from popping bugs with unnecessary feathers and hackles. They are as pointless as the cute eyeballs and smiley faces that some companies apply. To get a bug that pops every time, it’s all about the shape of the head and the angle of the hook eye. I like a flat face that tapers, and the taper goes from the hook eye up to the top at an angle. That hook eye sits on the bottom of the bug. This makes the bug sit at an angle in the water. With that slanted zing it will make all the noise you want, but when the presentation is over and it’s time to pick the fly up, it’s already at the right angle to be extracted quietly from the water. The other thing that you need is a hook longer than the bug body. This will further ensure that the bug sits on the water at an elevated angle, with that face pointing up. Done this way, the hook is the first thing to come into contact with a bass, no matter which angle that bass approaches the bug at. What so many popping bugs do is have the hook positioned almost directly underneath the body, so the fish has to grab the whole body and the hook together to get hooked up. Last but not least, modern popping bugs need to have legs. But they should be applied in a particular way. Many people make all the bug legs the same size, the result being that the ones in the back tangle in the hook. I leave the legs at the front of the bug long and form a taper moving back toward the tail. The last rubber legs, those closest to the tail, are the shortest—they still twitch but they don’t foul the fly, which just makes a wasted cast. DK: And what about the body? Are you using spun deer hair? LK: Hell no. Fly fishermen don’t fool with no damn deer hair. It’s wet and soft and mushy. I want my bugs to float. I usually make them from cork but I also will use foam when I have to. DK: Let’s move on to the subject of specific fish. What’s one fish you wish you could have back? LK: I was on the Penobscot in Maine, way up near Bangor. The Penobscot is incidentally one of the most unbelievably beautiful smallmouth rivers in the country. It’s got grass beds, ledges, everything you need for good smallmouth habitat. As we floated downriver we approach an old mill of some kind, high on a hill with a dam where the water came sluicing out the bottom, making a deep gouge in the river. There were giant swirling eddies and it was quite deep. Luckily I had a lead core line with me and I put on an eight-inch Deceiver because the guide told me there were some really huge bass in there. Before I go any further I’m going to tell you that I don’t lie about fishing. If you get caught up in a real lie then no one will ever believe you again. So what I’m about to tell you is factually true. I put this Deceiver on and did what I do in extremely deep eddy water, which is count the fly down and let the fly swirl about in the current. This fly sank eight or ten feet and then I felt something and I set the hook. Well, out of the water came a smallmouth that went well, well over seven pounds. It was at least twenty-eight or twenty-nine inches long, just an unbelievable fish. I fought that darn thing for probably five minutes. It jumped several times. But apparently the hook set I put on it in that swirling water didn’t really amount to much, because I lost it. That was definitely the best smallmouth that I ever hooked and lost. The other place I know of where there are definitely six- and seven-pound river smallmouths is the New River below Claytor Lake. The problem is that much of that water is not only very clear but very deep. In seven and eight feet of water, you can still easily see the bottom. And the river gets much deeper than that. The problem is that it’s extremely difficult to get flies down to them in clear water with a fly line. But if you can find a way, you can get into some truly large fish. Chuck Craft was the top guy down there for years. He showed me records and photos of fish six and seven pounds that some of his clients caught. There are some big fish there, but that one on the Penobscot that day was bigger. And that’s no lie. DK: Leave us with your favorite smallmouth memory. LK: Probably the most memorable bass I ever caught happened when I was wading in the Potomac above Brunswick, Maryland, which is about forty miles above Washington, D.C. I was using that Lefty’s bug I just described. Anyways, while wading in shallow water and casting the bug into four foot of water, I caught my first five-pound smallmouth. Actually he weighed five pounds, four ounces exactly. I shouldn’t have done it but I brought it home, I was so damned tickled with him. DK: Is that fish on the wall now? LK: No, I never mounted it. I just came home and like a young kid, I probably was only in my twenties, I had to show it to everybody. It wasn’t so easy to share images of fish back in the day. Most of us never had a camera. It was definitely a different time.